ANCP – Abnormal control plasma. Sets in liquid form – do not require dilution. Universal application: suitable for use with any principles of measurements and equipment – hand work; Coagulation analyzers – optical, mechanical, automatic. 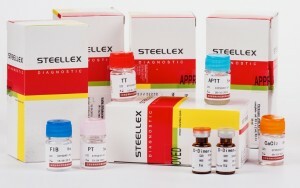 Various amount of packaging: from 200 up to 500 tests per kit. The stability of the reagents. Easy to use: do not require dilution, immediate usage. 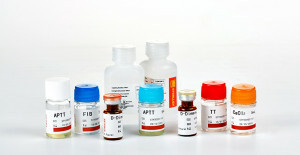 High precision: the same activity of one lot of reagents in separate vials. Excellent stability: 2 year shelf life when stored under prescribed conditions, are stable for up to 30 days after opening. Reagents for hemostasis determination Steellex passed quality control and diagnostics of manufacture and have obtained CE certificates and ISO13485: 2003, registered in the Ministry of Public Health of Ukraine. Listed by wholesale selling prices for medical products in Ukraine.